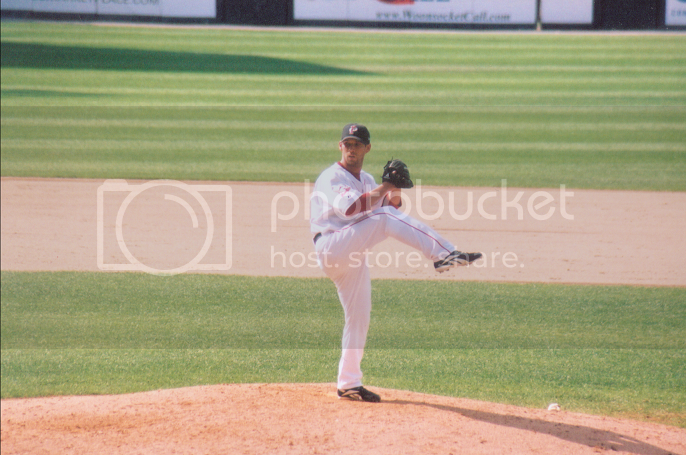 The first time I saw Craig Breslow was not in San Diego, but in Pawtucket. I thought he was odd-looking - all knobby and flushed and wearing an ill-fitting uniform. Nothing special. I had no idea I'd be seeing so much of him. There is no glory in being a triple-A reliever who hasn't come up through the system. Or one that's been lodged at the same level for a couple of years... growing older and less interesting. You can have a freaky-low ERA and be real stingy with walks and hits but seriously, no one cares. You may get called up here and there but aside from that, no one's paying much attention to you. No one in AAA wants to be there. They're all just tarring up their bats and working on their third or fourth pitches. Waiting. Working out. Sometimes complaining. Getting jealous when someone MUCH LESS DESERVING gets called up because, damn it, that should be THEIR job. Anyway, Craig Breslow was a nice guy. The Indians claimed him off waivers but they don't REALLY need another lefty in the pen. He's out of options so... they're likely to try and sneak him through waivers to the minors, send him to freaking Buffalo. Who knows what's going to happen. Craig Breslow's best year in Pawtucket was '06. He pitched 67 innings in 39 games... had 7 wins as a reliever (one lonely loss) and wrapped it up in a .269 ERA. 2007 was more of struggle for the kid, and we can leave it at that because I'm feeling magnanimous and I like Breslow. Take care of that arm! Maybe we'll see you in the IL!